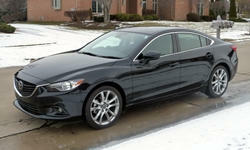 2014 Mazda Mazda6 Pros and Cons: Why (Not) This Car? Judging from what sells and what doesn't, few midsize sedan buyers make an engaging driving experience their top priority. Mazda has learned this the hard way: the company shifted only 33,756 midsize sedans last year, about as many as Toyota sold each month. But perhaps the 2009-2013 Mazda6 just wasn't sufficiently engaging? With the 2014, Mazda doubles down on its bet that midsize sedan driving enthusiasts are out there, only waiting for the right car. But is this the one? No light show. If it's not functional, it's probably not here. People who want a car that's exciting to drive tend to also want one that's exciting to look at. On the latter Mazda has delivered, with the look Nissan was aiming for with the 2013 Altima. The latest rendition of Mazda's corporate grille is large but not disproportionate or brash. Like those on the 2009-2013 car, the front fenders on the 2014 Mazda6 break from the body to form arches. But these arches are better integrated with the rest of the design (note how they mirror the roofline). From the front quarter, there's more than a hint of Maserati. An extra inch or so between the front wheel and the A-pillar touchdown point and a trim front overhang (possibly enabled by the lack of a V6 engine option) yield the sportier, more conventionally attractive proportions of a rear-wheel-drive car. Beyond this front clip the new Mazda6 doesn't push the styling envelope as far as the Ford Fusion does. Bodysides sleeker in profile, fuller in cross-section, and topped by a slightly less sweeping, inch-lower roofline avoid appearing slablike. The Mazda6's lean lines continue into hind quarters much less massive than the Ford's. Arching lines like those up front might have looked sportier (Maserati Quattroporte), or they might have looked heavier (Infiniti M). Judging from their absence, the latter must have been the case. Overall, a timelessly gorgeous car. Viewing the Mazda6 and Ford Fusion side-by-side, the shape and size of their windshields and side windows don't appear to differ much. But, as with the exterior styling, it's amazing how much difference an inch here and an inch there can make. Drop down into the Mazda's driver seat, and the view forward is far different than in the Ford. You seem to sit dramatically higher relative to a much more compact instrument panel, but without seeming to sit high (as in other midsize sedans with good forward visibility). This combination promotes a more intimate, more confidence-inspiring connection with the car, the road, and the outside world. Inside the car, knobs and buttons are close at hand, simple, and very easy to understand and operate. Much leaner, more athletic proportions than Fusion or Sonata. White-on-black instruments. Knobs and buttons could hardly be easier to reach and operate. As a clean sheet "SKYACTIV" car, the 2014 Mazda6 should deliver agile, engaging handling. It does readily out-handle competitors--except for the Ford, where the outcome is mixed. Compared to the Fusion, the Mazda6 feels much lighter and smaller. This is partly because it is a couple hundred pounds lighter, but also because of the aforementioned driving position and lower effort, less deliberate steering. The Ford wins back points with more communicative (if still far from chatty) steering and more aggressively damped suspension tuning (at the expense of some low-speed ride quality; the Mazda's ride is more pliant, if also a little busier). Push both cars hard, and the Mazda rolls more and loses its composure sooner. In less aggressive driving, though, the Mazda is more responsive and involving, and so more fun. But is it fun enough to matter? The Mazda6 feels agile and involving compared to competitors, but this is a low bar to clear. Compared to a well-tuned compact like the Mazda3 or Ford Focus, it feels like...a 191.5-inch-long family sedan. Mazda figured out that performance without efficiency is no longer viable even for many driving enthusiasts. Hence the second focus of SKYACTIV: superior fuel economy. The V6 engine, with its segment-trailing EPA ratings of 18 mpg city, 27 highway, is gone. While a diesel has been promised as a future performance option, this year every Mazda6 will have a 184-horsepower 2.5-liter four-cylinder engine under its hood. The 2013's less powerful (170hp) 2.5-liter four managed only 21 mpg city, 30 highway. The 2014 does far better: 26/38. Among conventionally gas-powered competitors, only the Nissan Altima is more fuel efficient, and not by a significant margin (27/38). The Honda Accord, with a CVT like the Nissan, does a little better in the city (27) but worse on the highway (36). Everyone else is at least an mpg or three behind. Later this year an option package on the Grand Touring will include a regenerative braking system that stores recouped energy in a capacitor. Other such systems rely on a conventional battery for energy storage, and these don't charge and discharge as quickly or efficiently. Efficiency at the expense of performance wouldn't pass muster with driving enthusiasts. The biggest surprise with the Mazda6 is how well the naturally-aspirated four performs. No, it can't go toe-to-toe with competitors' boosted fours and V6s. But compared to their base, efficiency-oriented engines, Mazda's new SKYACTIV 2.5 feels energetic and produces an unexpectedly satisfying snarl when revved. (Oddly, the same engine in the 2014 CX-5 makes more noise of a less pleasant quality.) For anything beyond casual driving the engine does need to be revved. At low rpm it feels somewhat soft and sounds a little cobby, but this only indicates that no magic is involved, only thorough engineering. Given the need to rev the engine, a responsive transmission is essential, and the SKYACTIV six-speed automatic rises to the occasion. Employing a small torque converter only at low speeds, and a lightning-quick multi-plate plate otherwise, this transmission shifts very quickly and provides a direct, not-at-all slushy connection between the engine and the front wheels. The transmission generally grabs the gear you want, when you want it. But should you desire manual control, paddles are attached to the steering wheel. Configure a Ford Fusion SE like the Mazda6 Grand Touring, and it lists for $690 more, $30,980 vs. $30,290. But adjust for feature differences using TrueDelta's car price comparison tool, and the difference comes out to exactly zero. So like the Fusion, the Mazda6 costs more than a Kia Optima (to be specific, about a grand more after a $600 adjustment for additional features), but about equal to or below everything else. Even a Hyundai Sonata Limited with Premium Package checks in only $770 lower. And if you adjust for the Mazda6's additional content, it actually emerges with a $180 advantage. Seems fair enough, so what's the problem? Well, if you only require, say, heated seats, leather, a sunroof, OR (not AND) nav, Mazda's packaging forces you to get all of them, as these features are only available--as standard--on the top level Grand Touring trim. If you want heated seats on a Sonata, you only need the GLS with Popular Package, which lists for $7,795 less. The attractiveness of the 2014 Mazda6's prices depends heavily on which features you're willing to pay for. The Mazda6's svelte, athletically proportioned body comes at a typical price: rear seat room, as in the Ford Fusion, is merely adequate. Sitting behind my 5-9 self, my knees and head have only an inch or two of clearance, my shins none. Among major competitors, only the Chevrolet Malibu has a tighter rear seat. To carve out even this much room beneath the plunging rear roofline the new Mazda6's rear seat cushion is slightly undersized and positioned too low. That in the Fusion is more supportive. A deal killer? Unless space for large adults is a priority, no. A large grille that is actually tasteful. Single chrome accent repeated on the trunk lid. Adequate room, but cushion is too low. The 2014 Mazda6's interior materials and build quality are about equal with those in the Altima, Camry, and Passat. Little if anything seems downright cheap. The problem is, the Koreans have been improving their interiors, and Ford and Chevrolet now lead the pack with interior materials, body structures, sound deadening, and suspension tuning that deliver a decidedly premium look and feel. Beyond the middling quality of its materials, the Mazda6's interior (in sharp contrast to its exterior) isn't dressed to impress. The primary instruments are basic white on black, the information displays are small and simple, and the controls remain thoroughly conventional. You'll find no light show here. Minimalists who focus on function, and especially the function of driving the car, might discover nirvana. But, the black interior's plentiful red stitching notwithstanding, the general public will more likely be underwhelmed. As alluded to above, Mazda didn't attempt the hushed interior of a luxury sedan, and the 2014 Mazda6 doesn't include one. It's not loud inside, even at highway speeds. It's just not quiet, either. The Fusion and especially the Malibu better suppress wind and road noise. They also weigh a couple hundred pounds more. These things are connected. The front seats are reasonably comfortable. But, given the Mazda6's focus, they should provide more lateral support. As with the CX-5's similar buckets, "one size fits all" side bolsters are spaced and contoured for large drivers. Unlike others, Mazda isn't trying to beat Toyota by being all things for all people. Instead, the 2014 Mazda6 focuses on the things driving enthusiasts care most about--styling, handling, efficiency--while being at least adequate in other areas. Among competitors, only the Fusion seriously attempts this combination. The Ford feels tighter and more solid, but the prettier Mazda feels lighter and more engaging, and is more purely a driver's car. Is it fun enough to sell based on the driving experience alone? Probably not. But factor in a body to die for and excellent fuel economy, and the 2014 Mazda6 should avoid the fate of past midsize Mazdas. Revs enthusiastically with a satisfying snarl. Yet also very efficient. Unlike in the pretty but fatally flawed early 1990s Mazda 929, a competitive trunk. Che Shaydak and Mike Dugan at Suburban Mazda in Troy, MI, provided the car. Mike can be reached at 248-519-9527. 2014 Mazda Mazda6 pros and cons, according to Michael Karesh: the best reasons for buying (or not buying) the 2014 Mazda Mazda6. Join TrueDelta to post your own impressions.